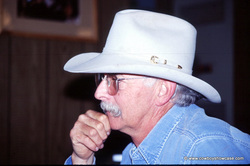 Mike Meaux, Meeker, Colorado saddle maker, is also a seasoned cowboy. He says all his poems are about real life places and incidents that he has seen in his career as cowboy and horse trainer. He came to help us gather strays. That he was sure a hand. He had these feathers in his hat. They almost seemed to glow. And brand new spurs on top of that. Their purpose, he must know. To pick the perfect mount. The buckskin horse would be his pal. At least on this he’d count. He saddled up and cinched up tight. Then down the drive they sped. Out of control? Perhaps a might. They headed for the shed. To get rid of this goof. A duck, a jump or maybe two. He threw him on the roof. The kid did bounce across the tin. Our hearts all skipped a beat. He landed on his feet. The buckskin didn’t run away. and knew that this would be his day. This ride would be real short. The kid eased up and nabbed the rein. He’d show us one more thing. and up there he did swing. Ol’ Buck began to spin. the kid was off again. For he had run amok. "Hey kid! You drive the truck." I pray it will survive. And I can see it all. They’re caught up in "the race". I know He hears my voice. This is my church of choice. With another tale to tell. Ol’ Pete and Slim been here for years. They knew this country well. Out near the old line shack. Until that calf turned back. The two old timers knew to wait. That calf would soon return. Had lessons yet to learn. And built himself a loop. With his first swing the colt would bolt. He didn’t know the scoop. As they went flying by. He pitched the kid sky high. When on the ground he lit. All thru the patch this poor kid rolled. It pained him now to sit. They filled his clothes, there is no doubt. He truly was a mess. I’ll make this story short and sweet. And nothing else but a smile.